When I asked around about family-friendly London hotels, the four-star Novotel London Waterloo was mentioned frequently. I heard about the family rooms that can accommodate two adults and two children, and the indoor children's play area. This was enough for me to think it was time to visit with my nine-year-old daughter to test it out for ourselves. While this is a wonderfully central location it's also away from the late night noise of the capital so you will get a peaceful night's sleep. There are also many bus stops nearby and you can be at Piccadilly Circus (no.3 bus) in around 20 minutes. Up to two children (under 16) can stay for free and each child receives a free welcome gift. Children's buffet breakfasts are also free when accompanying their parents/carers. There's plenty of choice from hot and cold options too. The rooms are spacious with complimentary wifi and satellite TV, and the safe is large enough for a laptop, plus tablets, etc. The very large hotel lobby has an X-box games console for guest use – don't worry, it's not so loud as to disturb other guests. There's also a small playroom for under 8s and a touchscreen table for playing games together. The hotel bar is close enough that you can keep an eye on the kids and enjoy a drink at the same time. The hotel has a sauna and steam room which children can use with adults. This isn't common in London as these type of facilities are usually not available for under 16s. The hotel check-in is from 2 pm, which is earlier than most London hotels, and the hotel check-out is at 12 pm midday, which is later than most, giving you a really long time to enjoy the room. The hotel can also offer a late check-out of up to 5 pm on Sundays. UK families will appreciate the secure on-site car park for up to 40 vehicles. 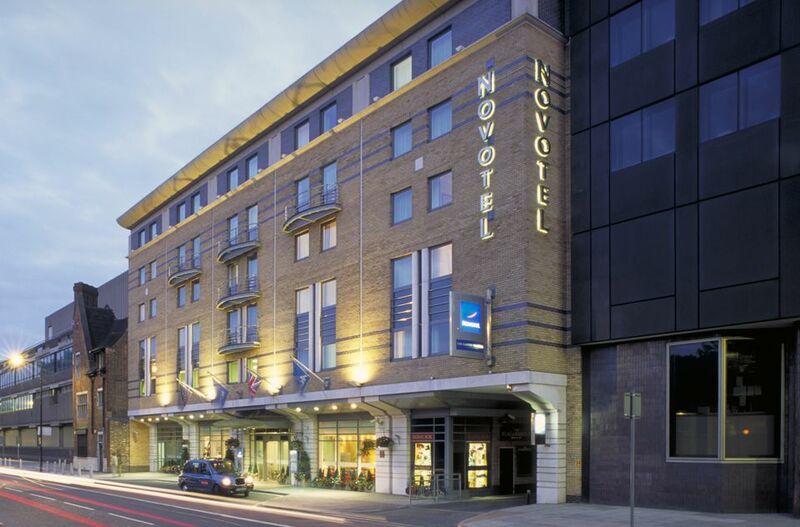 I stayed at Novotel London Waterloo for one night during a school holiday with my nine-year-old daughter. We received an excellent welcome at check-in and found all the staff we met to be welcoming to all the family. My daughter loved the free gift (she got a craft activity) and it kept her entertained throughout our stay and for the rest of the week. I knew we'd entered somewhere family-friendly when I saw a couple with a baby buggy coming out of the lift/elevator and some toddlers playing the touch screen table with their parents. My initial concerns that this would mean 'screaming baby' noises all night were unfounded as I never heard any sounds from other children. The guests we met came from many countries so it was nice for the children to play together and know that language skills aren't always needed to be happy. This reminded me of childhood family holidays to Spain where I was free to 'chat' with all the children I met in the hotel and my parents knew I was safe. The X-box was a draw for the older children and the free wifi throughout the hotel meant I could check messages on my phone while my daughter made a new friend. We stayed in an Executive room on the fifth floor. There was a large double bed and a sofa bed too. We had lots of space with a 'lounge' area next to the bed, a desk area, a 'kitchen' area with a Nespresso machine plus tea making facilities, a hallway with two wardrobes, plus a large en-suite bathroom. The room really did feel spacious as the large desk area wasn't next to the bed or TV. We were lucky as our room had views of Big Ben, the London Eye plus St Paul's Cathedral and the City of London. All seen over the top of Lambeth Palace and the palace grounds. The bathroom had a clear wall between the bathroom and bedroom so I could see across to the window, on the other side of the bedroom, and see Big Ben while in the shower! My only negative point would be the lack of bedside plug sockets for charging mobile phones but there were outlets by the desk so this wasn't disastrous. We enjoyed the buffet breakfast in the morning and my daughter enjoyed having a hot chocolate made for her. We managed to drag ourselves away from the X-box to try the sauna and steam room in the basement. We didn't stay long but it nice to share this with my daughter. I now understand why this hotel was mentioned so often in conversations about family-friendly London hotels. It's all those extras (the welcome gift, friendly staff, X-box, playroom, free breakfast, etc) that make this is a really good choice for families visiting London. *As is common in the travel industry, the writer was provided with complimentary services for review purposes. While it has not influenced this review, TripSavvy believes in full disclosure of all potential conflicts of interest. For more information, see our Ethics Policy. What Is Hotwire's Secret Hot Rate? How Old Do You Have to Be To Stay in a London Hotel On Your Own?